British Prime Minister Theresa May has tonight lost a motion in the House of Commons on Britain’s deal on withdrawal from the European Union by a large margin of 432 votes to 202. As a result, tomorrow [Wednesday] evening, May will face a vote of no confidence in her government which, if passed, will force a new British general election. If rejected, it will likely set a course for a crash Brexit, meaning a progressive hardening of the border through Ireland. Earlier, MPs also overwhelmingly rejected (by 600 votes to 24) an amendment to put a time limit on the ‘backstop’, which is designed to prevent a remilitarised border. Three similar amendments were withdrawn. Immediately after the EU Withdrawal Agreement was voted down, Labour Party leader Jeremy Corbyn (pictured) introduced his motion of no confidence in the Tory/DUP government. Speaking in the Commons, he said the “catastrophic” rejection of the Brexit deal was “the greatest defeat [for a British government] since the 1920s”. He said the prospect of a no-deal Brexit must be taken off the table. 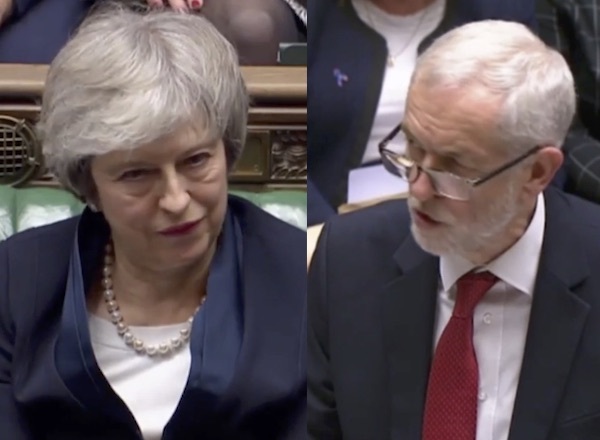 If Labour and the other opposition parties fail to win the no confidence vote tomorrow evening, Westminster MPs will face a choice between negotiating a cross-party compromise, agreeing to hold a second Brexit referendum, or (less likely) delaying further in the hopes of a cave-in by the EU. The leader of the Scottish Nationalist Party, Nicola Sturgeon, said the defeat on the Brexit deal had been “historic” but that it had been obvious for months that it was coming. The Dublin government is considering plans for what to do on March 29, when Britain is now set to fall chaotically out of the EU. Sinn Fein Leader Mary Lou McDonald said that Ireland needed to be protected from Brexit and that the 26 County Taoiseach Leo Varadkar should “stand firm”. “Ireland’s people, Ireland’s economy and Ireland’s peace process all need to be protected as we go forward now,” she said. “The Taoiseach and the Tanaiste and our partners at a European level need to stand firm and not move away from or attempt to dilute the backstop.